Old map by DELAMARCHE - Carte générale de L'Afrique divisée en ses principaux états par Fx Delamarche. . . 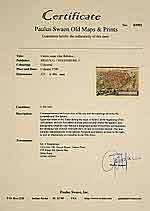 Title: Carte générale de L'Afrique divisée en ses principaux états par Fx Delamarche. . . Size: 19.7 x 24.8 inches. Condition: Folding and linen-backed map divided into 6 parts. Paper slightly separating from linen, overall in good condition. 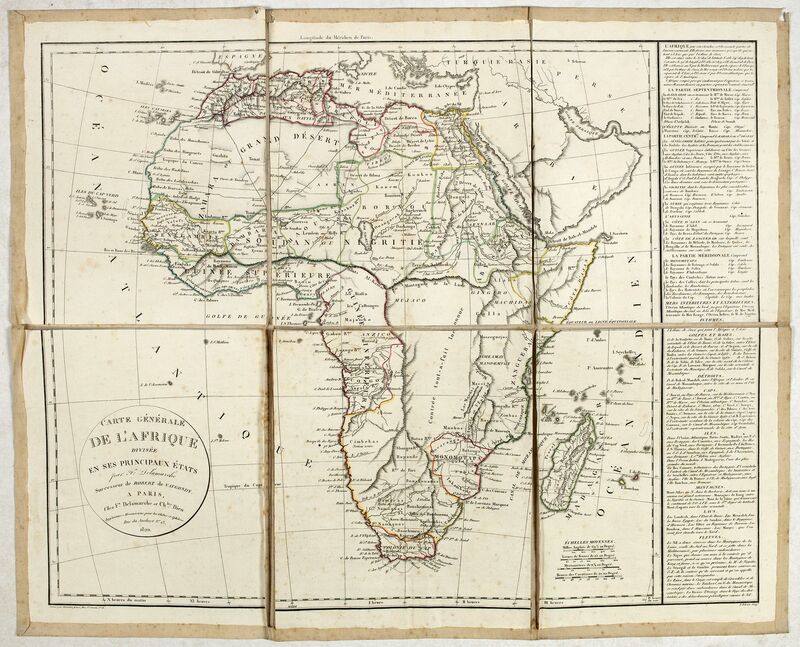 Uncommon map of Africa prepared by Felix Delamarche, after R.de Vaugondy. The "Zahara ou Grand désert" and Congo and Zambia "Contrée tout-a-fait Inconnue". In northern Africa a read system has been provided. In the right hand a lengthy description of geographical details of the different European countries, mountains, lakes, rivers, etc. Felix Delamarche was the successor to Robert Vaugondy as the Geographer to the King of France, and was one of the best mapmakers' in Frances in the early 1800's. He was well-known for his globes and spheres and the title cartouche mentions therefore : "Chez l'auteur Ingénieur-Mécanicien Pour les Globes et Sphères. . ."